Aftermarket rod and piston on top. Savings of over one pound per cylinder. This project started out with the goal of building a 7-plus litre engine for our customer's custom XJ-S project. 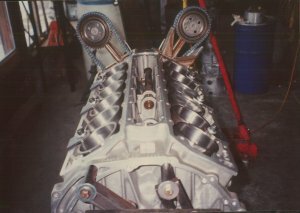 We started by doing the math on the 5.3 litre engine that came out of the customer's car. 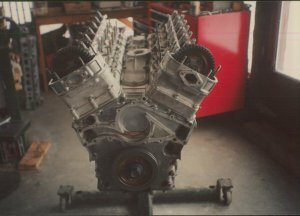 We quickly determined that the original engine would not make it because the bore and stroke configuration needed to achieve 7 litres did not leave sufficient margins for longevity. So we located a 6 litre engine and had it shipped in. 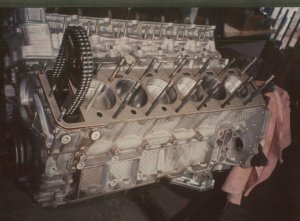 We tore down the 6 litre engine and sent the crankshaft to the machinist to be offset ground to allow for longer stroke and the smaller crankpin size of the lightweight aftermarket racing rods that we chose. Block with jug holes bored out and custom cylinders installed. The block had to be bored out to accommodate larger liners. To facilitate boring the block, we made surface plates for the top of the block which locate the center of each cylinder. Our design of the cylinder liners was straightforward, following the original design, only a larger bore. We also wanted them to be made of the strongest material available. We sent drawings of the liners to three companies. The company which seemed to have the right combination of design, material and price was chosen to make the liners. The cylinder head from the 6 litre engine had a dropped valve seat on the left head so we replaced all the valve seats on that head. (If one came loose, the others may not be far behind!) After the seats were installed, Walt went around each seat with a special punch and peened the aluminum casting material down over the edge of the seat to retain the seat a little better. We retained the stock valve size although we installed new valves and we cleaned the ports. We used stock springs because they have 8,000 RPM capability and do not overstress the valves. We chose Iskenderian re-ground cams with slightly more lift and duration. Finally we planed the heads slightly top and bottom to make sure they were straight. In our original calculations we came up with a configuration that yielded a compression ratio of 12.8:1. 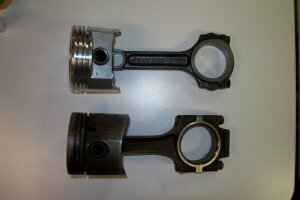 The height of the actual piston in the bore turned out to be slightly less than our calculations with a resulting (small) loss in compression. The final overall compression ratio tested out at 11.99:1. We decided to proceed and see how it ran. The rings are a composite of two aftermarket brands. The second groove rings are a positive seal ring. Plain cast iron rings were chosen for the balance of the set because they would "seat-in" immediately and not cause oil hotspots. One of the wrinkles we had to deal with in the assembly of the engine was the head gaskets. Since the new bore was considerably larger than original, we had to design new head gaskets and find someone to make them. We found a company that was not only willing, but economical also. The new gaskets are a very similar design to the originals and we found that by modifying a few water holes, they will also fit Flathead engines. The only other wrinkle was the width of the con rods. The racing rods were designed to fit in a GM (Chevrolet) engine. 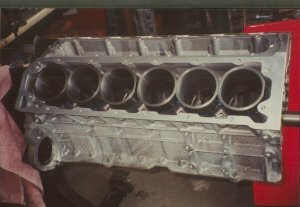 In order to use them in the V-12, the big end had to be reduced. 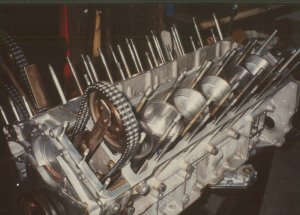 We found that by narrowing the rods and using chamfered racing bearings, we could get a satisfactory fit with side clearance spec as original V-12. We opened up the side clearance just a little to get better oil flow through the bearing to avoid too much heat build up. For a street motor the stock late-model oil pump is adequate. The 6 litre long block that we used was from a car that did not have an oil cooler. We decided to run the engine in this application with a cooler because it would have less distance to push the oil. We also polished the mains on the crank to give some more oil clearance so the oil would flow through faster. The theory is that this reduces pressure a little but increases flow, oil pump relief lifts less, and less head is imparted to the oil from pressure-related factors. In actual practice it seems to work with hot run oil pressure at road speed around 50 PSI and oil temperature way less than critical.